What makes a referral campaign truly irresistible? 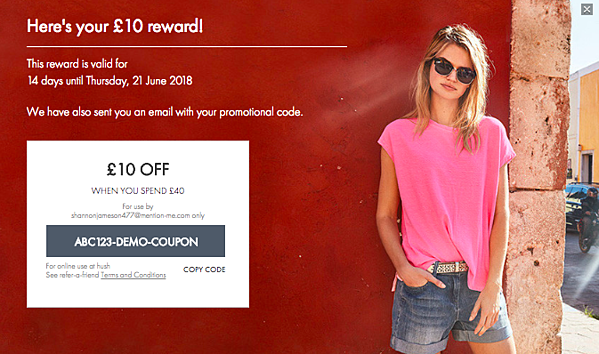 Ultimately, your target audiences’ decision over whether or not to sign up to a referral offer, is heavily influenced by one key asset: your referral offer landing page. Specifically, its contents and design. Referral success is driven by the perfect blend of copy and design ingredients that compel, convince, and convert new customers. When we dive into the nitty gritty of referral offer pages, one easy to follow framework can be particularly useful. It’s called the LIFT Model, developed by agency Wider Funnel. The ‘LIFT’ bit stands for ‘Landing Page Influence Function for Tests’. It boils down to 6 defining factors for analysing, testing, and improving landing pages and marketing content. We think it’s a pretty neat blueprint that lends itself well to designing, testing, and optimising referral offer pages. And it ties in nicely with the psychology of referral that we have discussed at length before. As the following visual demonstrates, these 6 factors can be grouped into three core types of influence over your conversion rate. The value proposition is your core conversion ‘vehicle’ - the defining articulation of your referral offer. 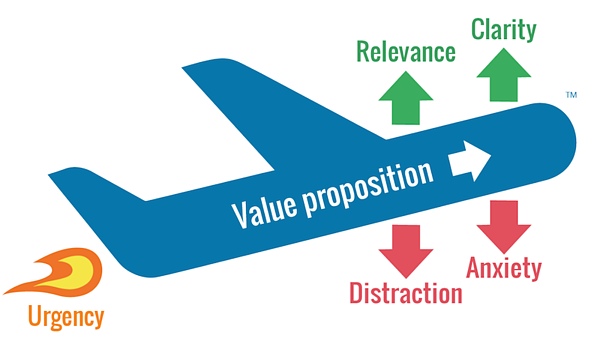 Relevance, clarity, and urgency are described as ‘conversion drivers’ — in other words, the key factors that give your value proposition fuel and propulsion. 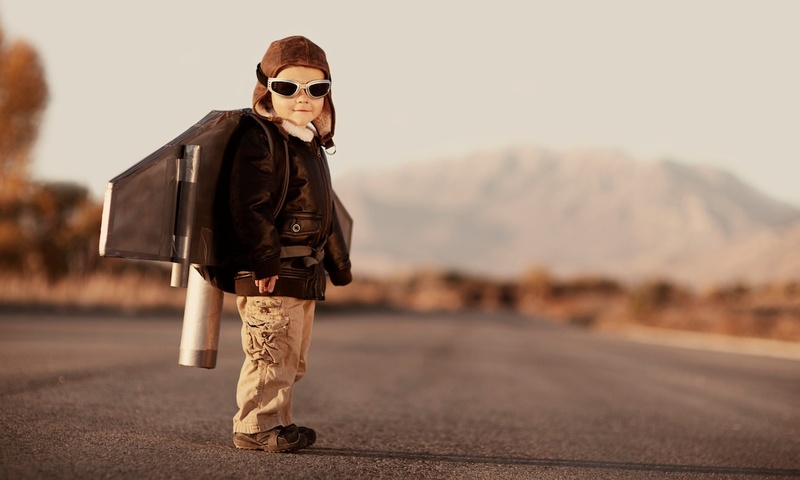 And then, on the other hand, anxiety and distraction are your ‘conversion inhibitors’ - or (to stick to the ongoing flight-related metaphor), the factors that weigh down the ability of your value proposition to soar. So let’s take a look at each factor in a little more detail, and consider how they can be applied to referral marketing campaigns. When a visitor lands on your referral offer page and asks themselves, ‘what is this and why should I care?’ — well... your value proposition is the response. As the benefits of a referral are generally two-way (with both the referee and their friend being rewarded) the same basic referral offer could be framed in differing ways. They each represent different modes of incentivisation. The first message gets straight to the bottom line of the existing customer’s ‘what’s in it for me?’ question — whilst the second speaks more to that customer’s selfless motivation to give and build their ‘social capital’. Which type of value proposition is right for any given campaign is down to the nature of your brand, the context of your product, and the preferences and behaviours of your customer base. Either way, testing variations in your lead value proposition can be critical to settling upon a winning formula for referral success. Relevance is determined by how aligned your referral offer is with your user’s expectations. In other words, context. the language you use: have you selected words that your users are most familiar with and are most likely to resonate with their values and expectations? the tone and voice you adopt: do you sound formal or playful; sales driven or friend-like suggestive? 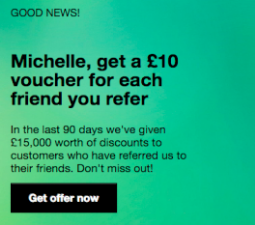 the location of your offer: does the introduction of the referral offer come at a point of customer delight or does it cause friction in the customer journey? This is a perfect example of a brand using their sassy tone of voice to great effect in their referral campaigns. Is your referral offer plainly communicated in ways that your customers will easily understand and be able to act on? what they are being offered? reasons why it’s a good idea to take up this offer? what they need to do to act on this offer? what happens next, after they’ve acted? Several of the brands we work with have tested concise vs longer copy in their referral campaigns, to improve clarity and improve conversion. Obviously, internal urgency is generally pre-existing when the visitor arrives on the page. But external urgency is something that can be influence by marketers, through the tone of voice and how offers and calls to action are positioned. A great example is including a time limited redemption period for the referral offer, to ignite a feeling of urgency to drive conversion. The key here is to understand your audience. 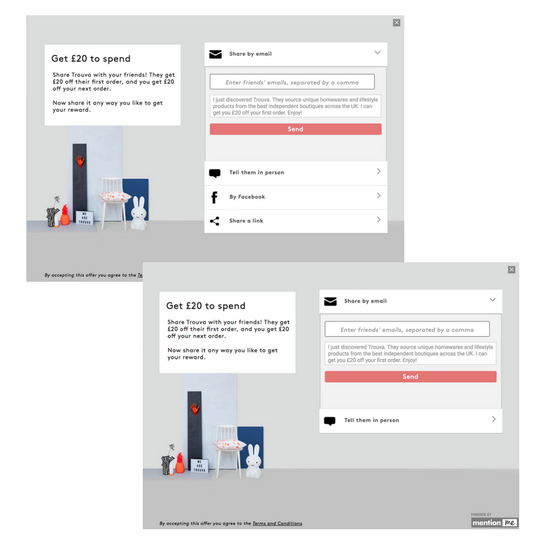 Research with one of our fast fashion clients showed that their customers waited until payday to make a purchase. In this case, using too short a time-frame, which expires before pay day, is likely to have a detrimental effect on conversion. 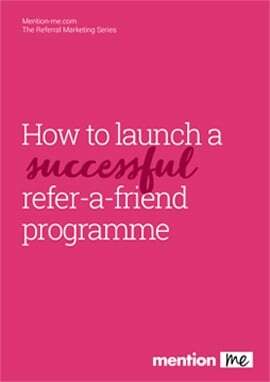 Whilst we have previously examined the social capital with regards to a customer proactively recommending a product, you should also consider any potential misgivings their friend could have about taking up a referral offer. Have you built up a sufficient level of trust and credibility in order to realistically expect them to convert to a customer? The beauty of referral is that the referred customer is predisposed to liking and trusting a product due to the association with their friend. Often, less really is more when it comes to conversion. Are there any aspects your content or design that are getting in the way of your visitors making sense of and acting on your offer? The more visual inputs and action options your visitors has to process, the less likely they are to make a conversion decision. Whilst we offer 16 sharing mechanisms we recommend that clients use a handful and test which drive the majority of conversions. In some cases, testing a reduced number of share options can result in an increase in conversion rate. 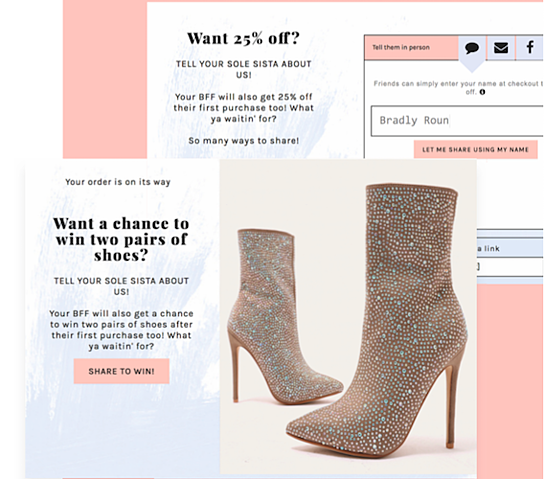 Indeed, this client tested a reduced number of share options and found that it led to an increase in customers sharing the offer, and a 20% increase in conversions. We hope that provides a starting point for using the LIFT model to optimise your own referral offer pages. We think that continuous analysis, experimentation, and testing around these six factors, will stand you in good stead for on-the-mark referral campaigns with conversion boosting results.